cutting performance you can rely on. Thinking outside the box for better shearing productivity. Our motorised guillotines tread a different path - one that promises productivity, speed and accuracy. Offering a strong, proven ‘Truecut’ guillotine design with brake motor and either an NC E21S control for programmable backstops, or highly accurate quick release manual backstops you can improve your cutting performance, decrease wastage and cost per cut. 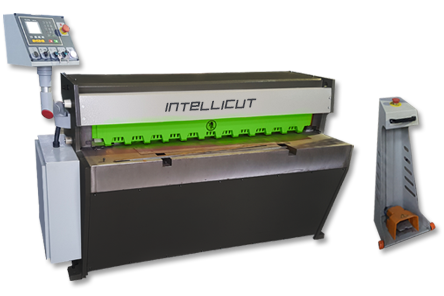 Who says only the big boys get all the features - the IntelliCut motorised guillotine is worthy of the name and packs a big punch in a small package! The guillotine is one of the busiest machines in a fabrication workshop. A strong, highly accurate and easy to use mechanical guillotine is an important part of the light fabrication process. We didn’t cut corners with our motorised guillotine, offering two models with a mix of design, features and components that exceed your expectations. Don’t compromise on quality - with the IntelliCut motorised guillotine, small is beautiful. The same premium build quality you find on our IntelliCut and IntelliFab ranges. High quality components throughout - thick frame and table for strength and stability whilst electrics, brake motor, back gauge, control and blades are all selected for the highest performance at this price point with most spares readily available in South Africa. Intelligent approach to the operator’s needs, such as easy to understand and flexible NC control, quality pedal with emergency stop, fast, accurate backstop (manual or automated), squaring and support arms with flip over stops, heavy duty table, automatic hold down, sheet ejectors and more. Excellent post sales support, including a 6 month parts and labour warranty. Available in two models (Series 1 and Series 2) with bed sizes 1300mm. Series 1 model: Programmable Estun E21-S control with 40 programs, 25 steps per program. Series 2: Manual quick release back gauge with sight glass. Backstops: automatic, motorised running on ball screws. Foot pedal: Heavy duty with emergency stop. Material support: Side squaring arm and front supports with flip over stops and squaring discs. Material handling: Heavy duty front table with hold down. Material ejection: rear slider plates for material. Guarantee: 6 months parts and labour, see terms and conditions of sale. 1.) The modern guillotine or shearing machine - an introduction.